Status: Inactive; Active 1985-2018.. Born: 1958-11-19. Spaceflights: 3 . Total time in space: 28.13 days. Birth Place: Longeville-les-Metz. Grew up in Toulouse, France. Educated Saint-Cyr; Ecole Polytechnique. French Air Force test pilot. BIRTHPLACE AND DATE: Longeville-les-Metz, France, 19 November 1958, but considers Toulouse, France, to be his home town. EDUCATION: Received a baccalaur�at from Coll�ge Militaire de Saint-Cyr-l'Ecole in 1976 and passed preparatory classes for les grandes �coles at the Prytan�e Militaire Lyceum, La Fl�che, in 1978. Graduated from Ecole Polytechnique, Paris, in 1981; from Ecole Nationale Sup�rieure de l'A�ronautique et de l'Espace, (ENSAE) Toulouse, in 1983; and as a Flight Test Engineer from Ecole du Personnel Navigant d'Essais et de R�ception, Istres, in 1987. FAMILY: Married, one son and one daughter. RECREATIONAL INTERESTS: Enjoys racket sports, skill games, canyoning, all flying activities. ORGANISATIONS: Member of the Association of Space Explorers, Honorary member of the French Aeronautic and Astronautic Association (AAAF). EXPERIENCE: Jean-Fran�ois Clervoy was seconded from D�l�gation G�n�rale pour l'Armement to CNES (French National Space Agency) in 1983, where he was involved in automatics and attitude control on projects like the SPOT Earth Observation satellite, the STAR inter-satellite optical link and the VEGA comet probe. Between 1983 and 1987, he was a lecturer in signal processing and general mechanics at the Ecole Nationale Sup�rieure de l'A�ronautique et de l'Espace, Toulouse. Clervoy also holds military and civilian parachuting licences, military and civilian diving licenses and a private pilot licence. 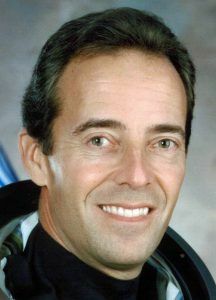 He was selected in the second group of French astronauts in 1985 and the following year participated in an intensive, five-month Russian language course. After graduating as a Flight Test Engineer in 1987, he spent the next five split between the Flight Test Centre, Br�tigny-sur-Orge, as Chief Test Director of the Parabolic Flight Programme (responsible for testing and qualifying a Caravelle aircraft for microgravity simulation flights) and the Hermes Space Vehicle Crew Office, ESA Toulouse, where he supported European manned space programmes. In 1991 he completed six weeks of training in Star City, near Moscow, on the Soyuz and Mir systems. The following year Clervoy was selected to join the ESA Astronaut Corps at the European Astronaut Centre (EAC) in Cologne, Germany, and in August was detached to the NASA Astronaut Office in Houston, USA, where he completed a year of training and qualified for assignment as a Space Shuttle crew Mission Specialist. He then worked on remote manipulator system/robotics issues for the Astronaut Office Mission Development Branch. Jean-Fran�ois Clervoy flew for the first time aboard the Space Shuttle Atlantis on the STS-66 ATLAS-3 (Atmospheric Laboratory for Applications and Science) mission in November 1994. The flight, which studied the composition of the Earth's atmosphere and solar energy output, included a high level of participation by European scientists and a significant ESA contribution in the field of remote operations. Clervoy used the robotic arm to deploy and later retrieve the SPAS atmospheric research satellite of the German space agency. Clervoy was subsequently assigned to the Astronaut Office Mission Support Branch at NASA where he was flight software verification lead in the Shuttle Avionics Integration Laboratory (SAIL), with responsibility for designing the robotics displays for the Space Station branch of the Astronaut Office. Clervoy was selected for his second spaceflight (STS-84), the sixth Space Shuttle-Mir docking mission which took place between 15 and 24 May 1997. During this flight he had numerous crucial tasks, including monitoring the performance of Shuttle systems during rendezvous and docking with the Mir space station. As Payload Commander, he was also responsible for more than 20 scientific experiments and assisted in coordinating the transfer of four tons of supplies to Mir during the five days of docked operations. Jean-Fran�ois Clervoy was thereafter made Deputy Chief of the computer branch for the Space Shuttle and the International Space Station at the NASA-JSC Astronaut Office. SPECIAL HONOURS: NASA Space Flight Medal, Chevalier de l'Ordre de la L�gion d'Honneur, Chevalier de l'Ordre National du M�rite, USSR Pilot-Cosmonaut V.M. Komarov diploma of the International Aeronautical Federation. Family: Astronaut. Country: France. Spacecraft: Mir. Flights: STS-66, STS-84, STS-84 Mir NASA-4, STS-103. Projects: STS. Agency: French Army. 1958 November 19 - . Birth of Jean-Francois Andre Clervoy - . Nation: France. Related Persons: Clervoy. French engineer cosmonaut 1985-2018. 3 spaceflights, 28.1 days in space. Flew to orbit on STS-66 (1994), STS-84, STS-103..
1997 May 15 - . 08:07 GMT - . Launch Site: Cape Canaveral. Launch Complex: Cape Canaveral LC39A. Launch Platform: MLP2. LV Family: Shuttle. Launch Vehicle: Space Shuttle. STS-84 - . Call Sign: Atlantis. Crew: Clervoy, Collins, Eileen, Foale, Kondakova, Lu, Noriega, Precourt. Backup Crew: Titov, Vladimir. Payload: Atlantis F19 / Spacehab Double Module. Mass: 115,900 kg (255,500 lb). Nation: USA. Agency: NASA Houston. Program: Mir. Class: Manned. Type: Manned spaceplane. Flight: Soyuz TM-25, STS-81 Mir NASA-3, STS-84, STS-84 Mir NASA-4. Spacecraft Bus: Shuttle. Spacecraft: Atlantis. Duration: 9.22 days. Decay Date: 1997-05-24 . USAF Sat Cat: 24804 . COSPAR: 1997-023A. Apogee: 393 km (244 mi). Perigee: 377 km (234 mi). Inclination: 51.70 deg. Period: 92.30 min. Atlantis blasted off on a night launch to Mir, docking with the station on May 17 at 02:33 GMT. Jerry Linenger, who had begun his stay on Mir in mid-January aboard STS-81, would return aboard STS-84. Michael Foale would be left at the station for his stint as the American crew member of Mir. The crew transfered to Mir 466 kg of water, 383 kg of U.S. science equipment, 1,251 kg of Russian equipment and supplies, and 178 kg of miscellaneous material. Returned to Earth aboard Atlantis were 406 kg of U.S. science material, 531 kg of Russian logistics material, 14 kg of ESA material and 171 kg of miscellaneous material. Atlantis undocked from Mir at 01:04 GMT on May 22. After passing up its first landing opportunity due to clouds over the landing site, the Shuttle fired its OMS engines on the deorbit burn at 12:33 GMT on May 24. Atlantis landed at 13:27 GMT at Kennedy Space Center's runway 33. 1997 May 24 - . Landing of STS-84 - . Return Crew: Clervoy, Collins, Eileen, Kondakova, Linenger, Lu, Noriega, Precourt. Nation: USA. Related Persons: Clervoy, Collins, Eileen, Kondakova, Linenger, Lu, Noriega, Precourt. Program: Mir. Flight: Soyuz TM-25, STS-81 Mir NASA-3, STS-84, STS-84 Mir NASA-4. STS-84 landed at 13:27 GMT with the crew of Precourt, Collins Eileen, Clervoy, Lu, Noriega, Kondakova and Linenger aboard..
1999 December 19 - . 1999 December 20 - . STS-103 Mission Status Report #03 - . Nation: USA. Related Persons: Brown, Clervoy, Foale, Kelly, James, Kelly, Mark, Kelly, Scott. Program: STS. Flight: STS-103. STS-103 Mission Status Report #02 - . Nation: USA. Related Persons: Brown, Clervoy, Foale, Grunsfeld, Kelly, Scott, Nicollier, Smith, Steven. Program: STS. Flight: STS-103. 1999 December 20 - . 00:50 GMT - . Launch Site: Cape Canaveral. Launch Complex: Cape Canaveral LC39B. Launch Platform: MLP2. LV Family: Shuttle. Launch Vehicle: Space Shuttle. STS-103 - . Call Sign: Discovery. Crew: Brown, Clervoy, Foale, Grunsfeld, Kelly, Scott, Nicollier, Smith, Steven. Payload: Discovery F27. Mass: 116,884 kg (257,685 lb). Nation: USA. Related Persons: Brown, Clervoy, Foale, Grunsfeld, Kelly, Scott, Nicollier, Smith, Steven. Agency: NASA Houston. Manufacturer: North American. Program: STS. Class: Manned. Type: Manned spaceplane. Flight: STS-103. Spacecraft Bus: Shuttle. Spacecraft: Discovery. Duration: 7.97 days. Decay Date: 1999-12-28 . USAF Sat Cat: 25996 . COSPAR: 1999-069A. Apogee: 609 km (378 mi). Perigee: 563 km (349 mi). Inclination: 28.50 deg. Period: 96.40 min. Bay 7-8: ORU Carrier (Spacelab pallet). Carried Hubble replacement spares arranged as follows: COPE protective enclosure with three RSU gyros, a new solid state recorder, and an S-band transmitter; LOPE enclosure with an HST-486 computer and voltage improvement kit; ASIPE enclosure with a spare HST-486 and spare RSU; FSIPE enclosure with a replacement FGS-2 fine guidance sensor; and NPE enclosure with New Outer Blanket Layer insulation. Bay 11: Flight Servicing System (FSS). Contained the BAPS (Berthing and Positioning System) used to dock with the aft end of the Hubble Space Telescope. Hubble was grabbed by the shuttle's robot arm at 0034 UTC on December 22. Following completion of repairs HST was released on December 25 at 2303 UTC. The deorbit burn at 2248 UTC on Dec 27 placed the orbiter in a 50 km x 616 km descent orbit. Discovery landed on runway 33 at Kennedy Space Center at 0001 UTC on December 28. 1999 December 21 - . STS-103 Mission Status Report #04 - . Nation: USA. Related Persons: Brown, Clervoy, Kelly, Scott, Smith, Steven. Program: STS. Flight: STS-103. 1999 December 22 - . 1999 December 25 - . 1999 December 27 - . 1999 December 28 - . Landing of STS-103 - . Return Crew: Brown, Clervoy, Foale, Grunsfeld, Kelly, Scott, Nicollier, Smith, Steven. Nation: USA. Related Persons: Brown, Clervoy, Foale, Grunsfeld, Kelly, Scott, Nicollier, Smith, Steven. Flight: STS-103. STS-103 landed at 00:01 GMT. .